Dale: [after a spear lands between his legs] I never thought I'd say this, but I'm glad I'm not hung like a bear. 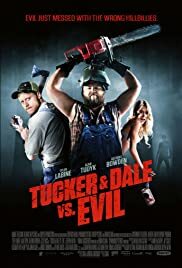 Compliments of Jet Music Inc.
What if you showed a backwoods-horror movie where city slickers take a wrong turn from the hillbillies point of view? What if they turned out to be basically decent folks who just wanted to go fishing at their vacation home? And, finally, what if it was the hillbillies who had to fend off against a murderous psychopath and got to take the pretty girl home? But of course make it so that our surrogate watchers, a bunch of college kids out in the woods, should presume to know that hillbillies are a bunch of violent inbreds because they're familiar with the same movie lore we are, say Deliverance onwards. Make it so that a man with a chainsaw whizzing above his head recasts the most epochal scene from Texas Chainsaw as accident. Our enjoyment is that we're always placed a little closer, watching for a little longer, to know that there is no horror movie outside what is being imagined. So there you have it; a Two-Thousand Maniacs with misunderstood maniacs. It's a clever idea, and new as far as I know in this field. Now if horror is generally looked down upon, even in cases of solid craftsmanship, I wager it's for how it posits a battle with evil in absolute terms. We know that life is more a complex struggle than Hammer served us. Every horror film that matters has innovated by placing us one step closer to where real horror is assembled. Vampyr posited that it happened because we wanted to. Psycho moved the monster from the swamps to next door, and that was important enough at the time. Night of the Living Dead posited an entire world of insensate havoc but with no malice in the instinctive drive. The Tenant and later Videdrome transferred every visible distortion back in the retina of the mind's eye. In Possession, horror was the visual representation turned inside out from tortured soul. This is just as good in this way. There is no evil outside a series of unfortunate events, we come to understand. There is only circumstance and our built-in notions of what any set of circumstances ought to mean. With film having saturated so deeply the world we know, in a lot of these cases what we claim to know we know from movies. Our loss is that the idea must have seemed so striking and novel to whoever was approached to fund, that the project was rushed ahead before there was a chance to iron it out. So the first joke, a great joke, is played over and over again and wears itself thin. The finale resolves with just sparks flying from a chainsaw fight. The extra layer that was probably tucked in at the last moment, is that the massacre backstory that we understood was just a campfire tale improvised on the spot, and was generic like a Wrong Turn sequel, is supposed to be culled from real life. So there was truth behind the legend, mangled many times over in the telling, that powers the chain of events to replicate it. It makes sense then that one part of the movie, where evil is imagined, always plays out like a movie. Every time he appears on screen, he swirls everything into the narrative he was taught to have sprung from. It's pretty nifty.